The collection's namesake, wanderlust, is a strong desire to travel. After returning from a recent west coast trip, Christy came back inspired. The laid-back vibe of Ventura, California allowed her to relax, do a lot of crafting, discover new foods, and places. The seaside location was full of nature, calming beaches, and good times with friends. 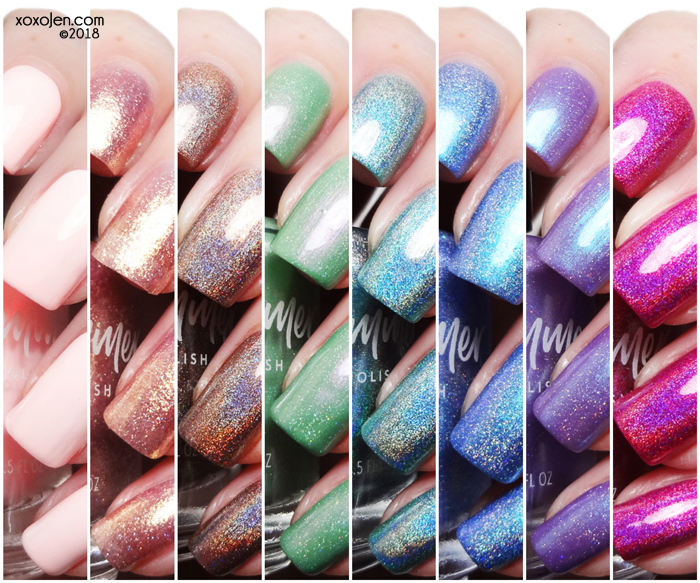 Let the first Wanderlust collection by KBShimmer take you to the West coast shore, nail polish style. It launches at 11am Central time on June 15th, 2018. Each polish is shown with two coats and topcoated with kbshimmer Clearly On Top unless otherwise noted. Formulas were all fantastic! Wander-ful World - Wandering the world, be it by car, plane, or cruise ship, can be so exciting. Wander-ful world was inspired by the vibrant fashions and showy pink flowers of California. This electric shade of magenta pink is full of linear holographic pigment for a flashy manicure perfect for your next trip, be it to the grocery store or across the country. This polish had me at hello. The rainbow is so vibrant and the shade of pink is perfection. Hakuna Moscato - California is known for amazing wine, and Moscato with its sweet, slightly bubbly flair was the perfect inspiration for this shimmery polish. Blushing rose gold micro flakes surround a scattering of micro holographic glitter, for an effervescent shade that will leave you thirsty for more. This polish builds up in 2-3 coats, or layer over your favorite shade to add a golden hue to your nails. Slightly sheer, this is shown in three coats. I love the purplish hue that can be seen at some angles. Meet Me At The Barre- When gathering with friends, the local bar is often the first place that is suggested, but with so many trying for a more active lifestyle, meeting at the barre for a workout might happen too! This pale pink shade has hints of coral, for a flattering pastel that will amp up the look of your summer tan. Pastel neon pink is such a difficult shade to capture accurately on camera, but I think I got pretty close! Cactus If You Can – The plant life in California is breathtaking, especially to someone that lives in the Midwest. This soft green shade is inspired by one of the best water conserving plants, the cactus. A soft pink shimmer and micro holo sparks, soften up this prickly polish. Love the color combo here, perfection in a bottle! Don’t Fear The Reefer – It is a sweet smell that many recognize from their college days. Now baked into brownies, made into candy, and available in several states. This once outlawed plant is now sold across California and inspired this minty aqua green shade. 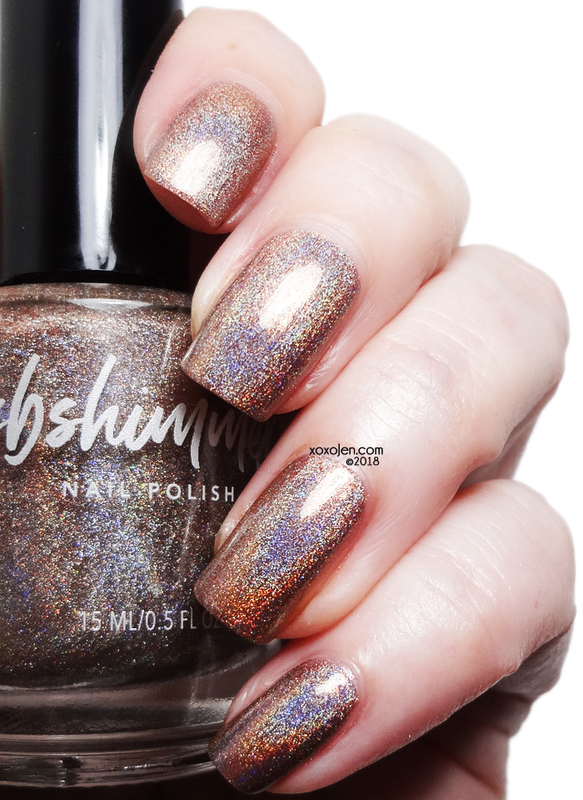 Loaded with linear holographic pigment, this is one far out polish that will not leave your manicure half-baked. Akin to Wander-ful World, the holo in this packs a punch! Don't let that bright blue flame fool you, this polish really is green. Now and Zen – Walking down the coast with the waves crashing, the gulls flying, and dogs running is the ideal way to center yourself for the day. This ocean inspired polish starts with a calming blue base. A color shifting shimmer takes this polish from blue, to aqua to lavender depending on the angle and lighting, while loads of micro holo flakes add a unique touch to the peaceful hue. That glowy shifting shimmer is everything ya'll. I captured it the best I could, but definitely head over to youtube to find a video. Stills just don't do it justice. Succ It Up - As a lover of succulents, it was amazing to see them growing outside! The many types of succulents with their luscious shades of green, pink, purple and blue inspired this shimmery purple polish. 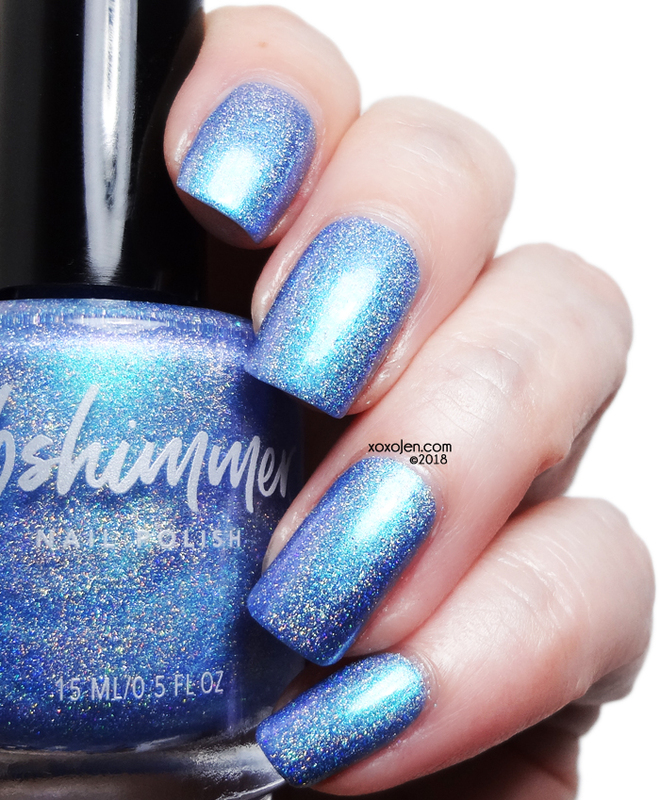 Holo micro flakes give this hue some sparkle, while a blue green shimmer completes this hip polish. Cousin to Now and Zen, the glowy flash in this is amazing! Again, look for a video of this, stills just cannot capture its beauty. Rise and Grind – Did you know that California has four of the top 15 coffee consuming cities in the US? No wonder it was easy to find people with a cup of Joe in their hands or in lines, waiting for baristas to fresh grind beans for the perfect cup. Rise and Grind is a nod to those coffee lovers who enjoy a splash of milk, tall lattes or iced coffees. A lightened brown, this linear holographic polish is the perfect deep neutral. So grab a cup and enjoy this coffee inspired shade! Gah. What more is there to say really? This is the perfect shade and my favorite in the collection. The holo in it is insanely beautiful. The Wanderlust collection launches 06/15/18 at noon at the kbshimmer.com website. Have you decided which ones to get? Lemme help ya out, just get them all. You'll be glad you did! :D I thought of you when I was swatching that one! Meet me at the Barre, and wanderful world were my favorites!